As of today January 23, 2019, the record-breaking government shutdown is now in its 33rd day according to CNN. 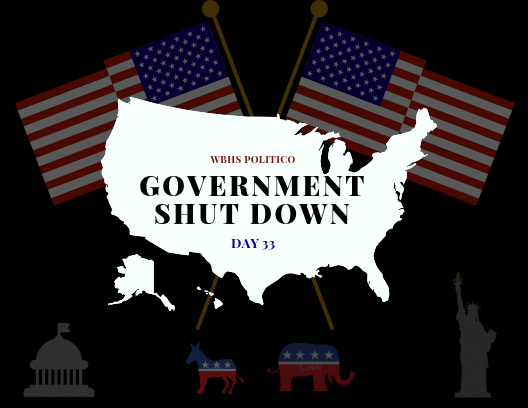 The government shutdown continues to be ongoing because the two major political parties have yet to find common ground. The parties are feuding over a wall that would span the entirety of the continental US-Mexico border. President Trump is asking for 5 billion dollars to fund the construction of the wall but according to the Huffington Post, researchers at MIT have estimated the wall would cost $27 to 40 billion dollars and take many years to build. According to ABC, President Trump in an attempt to compromise has agreed to revamped DACA (Deferred Action for Childhood Arrivals) and his proposal would also strengthen their protections if the wall is funded. Speaker of the House, Nancy Pelosi (D) has proposed funding to strengthen border security but refuses to fund a wall she has deemed unamerican. According to CBS, the government shutdown is affecting the lives of 800,000 workers and of those federal employees, 380,000 have been furloughed without pay. TSA workers are going without pay and according to CNBC, this will be their second missed paycheck. From the perspective of a teenager, it is time for the government to come to its senses. The intense separation between political factions and lack of compromise has led to many federal employees being unable to provide for their families and lack the finances to guarantee that themselves and their dependents have a roof over their head. This historic shutdown may not be affecting every US resident obviously but it is affecting our lives whether we choose to recognize it or not.